The 2016 Sierra Cup Series will be the USA Cycling Regional Championship Series for Northern California and Nevada. All events before July will be qualifiers for MTB Nationals at Mammoth. The Kirkwood Mountain Classic and Great Tahoe Flume race will be qualifiers for 2017 Nationals. Several races are promoted by independent promoters, the Series makes no promises for events not promoted by us. The linking thread for series events was to good races, good courses and supporting trails through the proceeds. We’ve donated $23k to trail groups since the Sierra Cup started in 2011. Thanks to sponsors AFX, Carson Tahoe Health and Super Burrito, we’re able to provide a $600 series purse to the Pro Men and Women as well as some other prizes. We’ll have great raffles at each event and our medals this year at races #2-#6 will be stellar looking bottle openers that you won’t be sure if you should hang it on the wall or put it on your keychain to use daily. We’ll also have Tahoe Beer “Crowlers” on the podium from Brewer’s Cabinet and Nature’s Bakery fig bars for snacks! Hosted by the Youth Bicyclists of Nevada County (YBONC), this is the first race in their Nevada City Series. Visit the registration page. View Results. 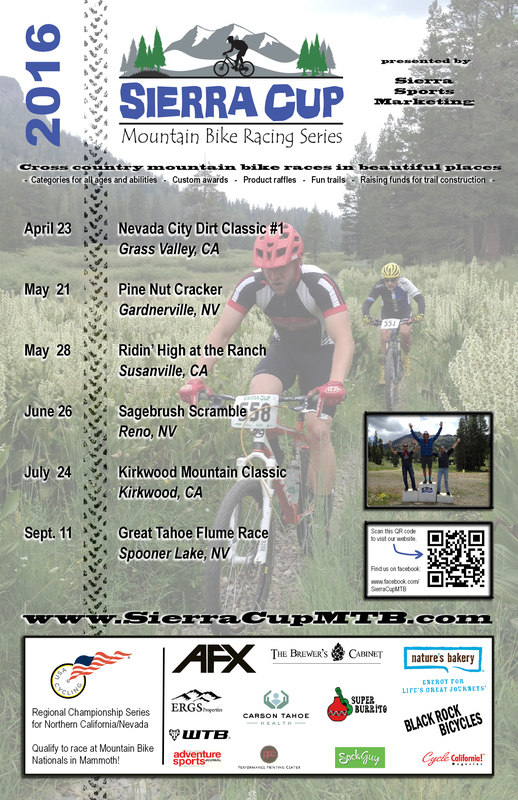 Hosted by the Alta Alpina Cycling Club, this long time event offers a fun course in the Pine Nut Mountains outside Gardnerville. Visit the registration page. See a course map. View Results. Hosted by the Susanville Area Bicycle Association at Susanville Ranch Park, this amazing trail network is worth a visit. You can’t help but have an ear-to-ear grin as you descend through the bermed corners and flowy trails during the race. Visit the registration page. View Results. This new event will partake in several of the ‘breakfast trails’ on Peavine; Bacon Strip, Over-Easy and Crispy Bacon. Last chance qualifier for those heading to Nationals in Mammoth. Vist the registration page. See a course map. View results. The high altitude classic cross country event continues as a fundraiser for TAMBA. Visit the registration page. View Results. This single loop classic will hopefully have even more new singletrack this year pending approvals by Nevada State Parks. Either way it will be plenty of high elevation miles and breathtaking views. Visit the registration page. View Results. Click Here for Series rules and information. Click Here for Frequently Asked Questions. Interested in sponsoring the Series? Check out our sponsorship proposal.